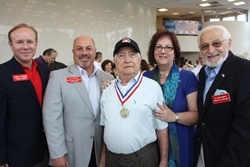 This morning, Council President David Fleisher and Council members John Amato, Jim Bannar and Melinda Kane attended a very special ceremony to honor Cherry Hill resident Edward Martino, a World War II veteran and Purple Heart recipient who served as a member of United States Army's 84th Infantry in Germany during the historic Battle of the Bulge. It was a tremendous honor to meet and pay tribute to this member of our nation's Greatest Generation. Please join me in thanking Mr. Martino for his years of service, from 1943 to 1945, and in thanking all the members of the United States military, both past and present, for their efforts to keep our nation safe and free. The Music Under the Stars summer concert series continues this Tuesday with the sounds of RB Express, who will take you down memory lane with your favorite Doo Wop, R&B, Motown, Country and Pop songs from the '50s, '60s and '70s. The show begins with opening act Haley Rossell at 6:30 p.m. Every Tuesday in July, Music Under the Stars promises music fans of all ages a front-row seat to exciting headliners and up-and-coming opening acts, brought to you by NFI and Republic Bank. Local food trucks will offer on-site dinner options, while the Friends of Barclay Farmstead will offer free guided tours of the farmhouse. Bring your blanket, a chair, and even a picnic dinner - just don't forget your appetite for great music! Click here for additional information. July is National Park and Recreation Month, and in celebration, the Cherry Hill Recreation Department and the Cherry Hill Mayor's Wellness Campaign are proud to offer several free and family-friendly events that will help residents of all experience levels to stay fit while having fun! Yoga in the Park, 8 a.m. every Sunday through Aug. 24, Croft Farm: Enjoy this free beginner yoga class, led by instructor Michelle Carlino. The class is perfect for all levels of yoga; just bring your yoga mat and some water! The class will take place inside the Croft Farm Arts Center in the event of rain. This class began Sunday, July 6, and will continue for six weeks. Registration is preferred, but not required. To register, e-mail events@chtownship.com, or call (856) 488-7868. Family Fun Boot Camp, 7:30 p.m. Mondays, July 21-Aug. 25, Croft Farm: The whole family will enjoy this free class that features cardiovascular conditioning, energizing circuits targeting major muscle groups, and flexibility training. Squat, lunge, dip, push-up, pass the medicine ball, battle rope, crunch and stretch your way to optimal health as a family. All children must be accompanied by a parent or guardian; all experience levels welcome. Class will be held in the Arts Center in case of inclement weather. Registration is preferred, but not required. To register, email events@chtownship.com, or call (856) 488-7868. The theme of this year's Park and Recreation Month is "Out is In," and with 52 parks and playgrounds and a vast system of local nature trails, Cherry Hill is the perfect place to enjoy the great outdoors. Visit the Township Website and follow the Mayor's Wellness Campaign and Cherry Hill Recreation Department on Facebook to stay up-to-date on upcoming events and activities. Cherry Hill Restaurant Week kicks off Aug. 10! Cherry Hill Restaurant Week is quickly approaching, and our residents and restaurants alike are gearing up for a week of delicious deals at some of Cherry Hill's best eateries! From Aug. 10-16, all participating restaurants will offer patrons a special 3-course dinner menu for $25 or $35, with several offering lunch options, as well. It's an exciting opportunity to promote local businesses, while giving our residents a chance to enjoy a special meal at a great price. Visit www.CherryHill-NJ.com/RestaurantWeek today to view a list of participating restaurants and their specially selected lunch and dinner menus - and don't forget to make your reservations! Restaurant Week is sponsored by NFI and supported by the participating restaurants. 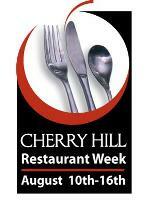 Be sure to like Cherry Hill Restaurant Week on Facebook, and follow @CHRestaurantWk on Twitter. We hope to see you there! 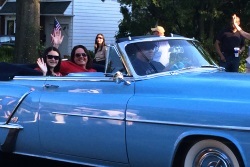 Council Vice President Sara Lipsett and Councilwoman Carole Roskoph celebrated Independence Day this year at the annual Erlton South July 4 parade and celebration, held on Saturday, July 5. The parade, hosted and sponsored by the Erlton South Civic Association, is a longtime community tradition, and the tight-knit neighborhood's largest celebration of the year. We were proud to once again be a part of the event, alongside residents, the Cherry Hill Fire Department, swimmers from the Erlton Swim Club, representatives from Chick-Fil-A, young bicyclists donning their best patriotic apparel, the Ferko String Band, and others. It was a beautiful evening to celebrate our Nation's Independence. We're already looking forward to 2015! Tax bills for the third and fourth quarter of 2014 are arriving in homes now, and third-quarter taxes are due on Aug. 1. Remember: You can pay your tax and sewer bills online anytime through the Township website. According to information from the Governor's Office, there will be no Homestead Benefit Credit issued in 2014. The credit is expected to be applied to May 2015 tax bills. For more information on the Homestead Benefit, click here. For questions about your tax bill, contact the Tax Collector's Office at (856) 488-7880. In just 15 minutes, you can save up to three lives! Blood shortages are occurring all a cross our region and every two seconds, someone needs you. If you are in good health, at least 17 years old and weigh at least 110 pounds, now is the time to roll up your sleeves and donate. Every blood type can save a life! Walk-in donors are welcome; however, appointments are preferred. Click here to register. Join us for a discussion of "The No. 1 Ladies Detective Agency," by Alexander McCall Smith. About the book: Motivated to help others and to make Botswana a better place, Precious Ramotswe opens up a private detective agency. This is the first novel in Alexander McCall Smith's widely acclaimed series. Lit with Librarians is a free, library-sponsored program for adults, conducted by librarians from the Cherry Hill Public Library. The group meets on the third Tuesday of the month; no registration required. Join us Tuesday or Wednesday morning for stories, finger puppets and songs! No crafts, but always lots of fun! No registration required. The Friends of the Library's book sales offer the opportunity to browse thousands of books, CDs and DVDs and pick up some great bargains! All proceeds benefit the library. Books are sorted into categories, and prices are as follows: $2 hardbacks, $1 paperbacks, $2 CDs and DVDs. On Saturday, $5 gets you a bag of books! Friends members gain early access to the sale at 6 p.m. Wednesday, July 16. New members can join at the door! Annual memberships start at $8. This is just a snapshot of the hundreds of events, classes, activities and cultural programs held at the Cherry Hill Library throughout the year. Click here for the full events calendar, and visit www.chplnj.org to sign up for CHPLink, the library’s e-newsletter. Reminder: The Library is closed on Sundays through Sept. 21. You can renew books, place holds, pay fines and much more 24 hours a day, 7 days a week through the Library website. Stay connected by following the Library on Facebook, Twitter and Pinterest. For more information on any library program, call (856) 667-0300 or email info@chplnj.org. Seniors: Don't miss Luncheon with the Arts at the Katz JCC! Residents 55 and older are invited to join us for a lively performance by Eddie McLoyd at the Katz JCC next Friday, July 18, from 10:30 to 1 p.m. McLoyd will entertain guests with the sounds of summer, with a Motown flair! A hot chicken lunch will be served following the entertainment. This is the latest installment in our Luncheon with the Arts entertainment series, and takes place in the JCC's Social Hall, 1301 Springdale Road. Tickets are $5 in advance, or $8 at the door. The event is sponsored by Zounds Hearing and the JCC. For more information, contact the Department of Recreation at (856) 488-7868, or email events@chtownship.com. This week, Chief William Monaghan and the Cherry Hill Police Department welcomed four new officers: Ankur Mankad, Matthew Morris, Christine Towne and Matthew Tilton. These bright men and women will begin their careers as Probationary Officers when they begin attending the Camden County Police Academy this Monday, July 14. We are excited to welcome these four individuals to the department. Please join me in wishing them all the best as they continue their training and begin what will, we hope, be long, safe and proud careers as Cherry Hill Police Officers. The Camden County Mosquito Commission is in the midst of its 2014 spraying season, and has already treated several areas in Cherry Hill in an effort to reduce the mosquito population. The Commission sprays areas throughout Camden County on an as-needed basis based upon the results of their surveillance efforts. Click here to report a mosquito issue in your neighborhood. The Township posts an updated spraying schedule on our website as it becomes available, along with tips for safeguarding your property against mosquito infestation. Councilwoman Carole Roskoph recently attended the 7th annual Veterans Car, Truck and Bike Show, benefitting Samaritan Healthcare and Hospice. The annual event, held at Cherry Hill High School West, has raised tens of thousands of dollars throughout the years, and added more than $8,000 to their total this year. These funds go toward providing care for uninsured patients, and supporting programs that Samaritan provides without receiving reimbursement. Thank you to John Giacoboni and the Car Show Team for their continued efforts, and for all of the great work they do to support our community throughout the year. The Car Show team has, for the last several years, supported the Township's Memorial Day ceremony by coordinating and cooking the BBQ lunch as a "thank you" to our servicemen and women. For more information on the Car Show, visit www.samaritanhealthcarenj.org. "The hippest place to be." 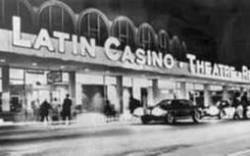 That's what people once said about the famous Latin Casino, open for business in Cherry Hill from October 1960 to June 1978. The "Latin" brought the biggest and best entertainers to Cherry Hill, from Frankie Avalon to Frankie Valli. Stop by the Cherry Hill Historical Commission's exhibit, on display in the lower level of the Cherry Hill Public Library, to revisit the celebrated theater through photos and other memorabilia. Special thanks to Joe Orman, nephew of one of the Latin Casino's owners, for his donation of signed celebrity photographs. The Historical Commission strives to document and preserve the history of our town. The Local History Room, located on the Library's lower level, is open by appointment only in the summer. If you have any Cherry Hill/Delaware Township memorabilia you wish to loan or donate, please contact the Commission at (856) 488-7886, or chhc@chtownship.com. The Cherry Hill Health and Racquet Club, a partner in the Mayor's Wellness Campaign, will once again offer its Teen Fitness Connection program for local teens. The program runs from June 30 to Aug. 31, and offers teens ages 12 to 17 a complimentary club membership that can be used to access fitness equipment and to participate in CHHRC's popular Group Exercise Classes. There is a $10 registration fee per family; participating teens can check into the club before 4:30 p.m. each weekday, and any time on Saturday and Sunday. Click here for more information. Yoga in the Park, 8 a.m. every Sunday through Aug. 24, Croft Farm: Enjoy this free beginner yoga class, led by instructor Michelle Carlino. The class is perfect for all levels of yoga; just bring your yoga mat and some water! The class will take place inside the Croft Farm Arts Center in the event of rain. This class began Sunday, July 6, and will continue for six weeks. Registration is preferred, but not required. To register, e-mail events@chtownship.com [mailto:events@chtownship.com] , or call (856) 488-7868. Family Fun Boot Camp, 7:30 p.m. Mondays, July 21-Aug. 25, Croft Farm: The whole family will enjoy this free class that features cardiovascular conditioning, energizing circuits targeting major muscle groups, and flexibility training. Squat, lunge, dip, push-up, pass the medicine ball, battle rope, crunch and stretch your way to optimal health as a family. All children must be accompanied by a parent or guardian; all experience levels welcome. Class will be held in the Arts Center in case of inclement weather. Registration is preferred, but not required. To register, email events@chtownship.com [mailto:events@chtownship.com] , or call (856) 488-7868. 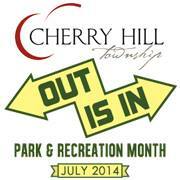 The theme of this year's Park and Recreation Month is "Out is In," and with 52 parks and playgrounds and a vast system of local nature trails, Cherry Hill is the perfect place to enjoy the great outdoors. 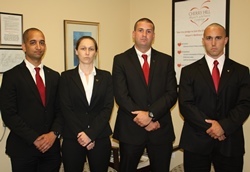 Visit the Township Website [http://www.cherryhill-nj.com/] and follow the Mayor's Wellness Campaign [https://www.facebook.com/pages/Cherry-Hill-Mayors-Wellness-Campaign/186080851562062] and Cherry Hill Recreation Department [https://www.facebook.com/pages/Cherry-Hill-Recreation-Department/153392904854925] on Facebook to stay up-to-date on upcoming events and activities. Cherry Hill Restaurant Week is quickly approaching, and our residents and restaurants alike are gearing up for a week of delicious deals at some of Cherry Hill's best eateries! From Aug. 10-16, all participating restaurants will offer patrons a special 3-course dinner menu for $25 or $35, with several offering lunch options, as well. It's an exciting opportunity to promote local businesses, while giving our residents a chance to enjoy a special meal at a great price. Visit www.CherryHill-NJ.com/RestaurantWeek [http://www.cherryhill-nj.com/RestaurantWeek] today to view a list of participating restaurants and their specially selected lunch and dinner menus - and don't forget to make your reservations! Restaurant Week is sponsored by NFI and supported by the participating restaurants. Be sure to like Cherry Hill Restaurant Week [https://www.facebook.com/CherryHillRestaurantWeek?ref=hl] on Facebook, and follow @CHRestaurantWk [https://twitter.com/CHRestaurantWk] on Twitter. We hope to see you there! Tax bills for the third and fourth quarter of 2014 are arriving in homes now, and third-quarter taxes are due on Aug. 1. Remember: You can pay your tax and sewer bills online anytime through the Township website. [https://wipp.edmundsassoc.com/Wipp0409/] According to information from the Governor's Office, there will be no Homestead Benefit Credit issued in 2014. The credit is expected to be applied to May 2015 tax bills. For more information on the Homestead Benefit, click here [http://www.state.nj.us/treasury/taxation/homestead/benefit.shtml] . For questions about your tax bill, contact the Tax Collector's Office at (856) 488-7880. In just 15 minutes, you can save up to three lives! Blood shortages are occurring all a cross our region and every two seconds, someone needs you. If you are in good health, at least 17 years old and weigh at least 110 pounds, now is the time to roll up your sleeves and donate. Every blood type can save a life! Walk-in donors are welcome; however, appointments are preferred. Click here [http://www.redcrossblood.org/make-donation-sponsor?date%5Bmin%5D%5Bdate%5D=&date%5Bmax%5D%5Bdate%5D=&field_sponsor_code_value=cherry%20hill%20library] to register. This is just a snapshot of the hundreds of events, classes, activities and cultural programs held at the Cherry Hill Library throughout the year. 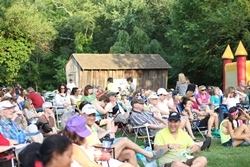 Click here [http://host6.evanced.info/cherryhill/evanced/eventcalendar.asp] for the full events calendar, and visit www.chplnj.org [http://www.chplnj.org/] to sign up for CHPLink, the library’s e-newsletter. Reminder: The Library is closed on Sundays through Sept. 21. You can renew books, place holds, pay fines and much more 24 hours a day, 7 days a week through the Library website. Stay connected by following the Library on Facebook [https://www.facebook.com/CHPLibrary?ref=search&sid=1520477213.2684015648..1] , Twitter [https://twitter.com/CHPLibrary] and Pinterest [http://www.pinterest.com/chplnj/] . For more information on any library program, call (856) 667-0300 or email [mailto:info@chplnj.org.Mayor] info@chplnj.org [mailto:info@chplnj.org] . 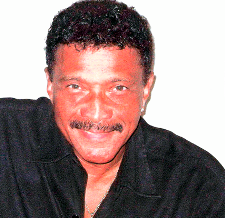 Residents 55 and older are invited to join us for a lively performance by Eddie McLoyd at the Katz JCC next Friday, July 18, from 10:30 to 1 p.m. McLoyd will entertain guests with the sounds of summer, with a Motown flair! A hot chicken lunch will be served following the entertainment. This is the latest installment in our Luncheon with the Arts entertainment series, and takes place in the JCC's Social Hall, 1301 Springdale Road. Tickets are $5 in advance, or $8 at the door. The event is sponsored by Zounds Hearing and the JCC. For more information, contact the Department of Recreation at (856) 488-7868, or email events@chtownship.com [mailto:events@chtownship.com] . The Camden County Mosquito Commission is in the midst of its 2014 spraying season, and has already treated several areas in Cherry Hill in an effort to reduce the mosquito population. The Commission sprays areas throughout Camden County on an as-needed basis based upon the results of their surveillance efforts. Click here to report a mosquito issue in your neighborhood [http://www.camdencounty.com/government/offices-departments/mosquito-commission?utm_source=] . The Township posts an updated spraying schedule on our website [http://www.cherryhill-nj.com/] as it becomes available, along with tips for safeguarding your property against mosquito infestation. Councilwoman Carole Roskoph recently attended the 7th annual Veterans Car, Truck and Bike Show, benefitting Samaritan Healthcare and Hospice. The annual event, held at Cherry Hill High School West, has raised tens of thousands of dollars throughout the years, and added more than $8,000 to their total this year. These funds go toward providing care for uninsured patients, and supporting programs that Samaritan provides without receiving reimbursement. Thank you to John Giacoboni and the Car Show Team for their continued efforts, and for all of the great work they do to support our community throughout the year. 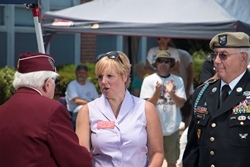 The Car Show team has, for the last several years, supported the Township's Memorial Day ceremony by coordinating and cooking the BBQ lunch as a "thank you" to our servicemen and women. For more information on the Car Show, visit www.samaritanhealthcarenj.org [http://www.samaritanhealthcarenj.org/] . "The hippest place to be." That's what people once said about the famous Latin Casino, open for business in Cherry Hill from October 1960 to June 1978. The "Latin" brought the biggest and best entertainers to Cherry Hill, from Frankie Avalon to Frankie Valli. Stop by the Cherry Hill Historical Commission's exhibit, on display in the lower level of the Cherry Hill Public Library, to revisit the celebrated theater through photos and other memorabilia. Special thanks to Joe Orman, nephew of one of the Latin Casino's owners, for his donation of signed celebrity photographs. The Historical Commission strives to document and preserve the history of our town. The Local History Room, located on the Library's lower level, is open by appointment only in the summer. If you have any Cherry Hill/Delaware Township memorabilia you wish to loan or donate, please contact the Commission at (856) 488-7886, or chhc@chtownship.com [mailto:chhc@chtownship.com] .